USAF Patch USAFE 38 TRS Tactical Reconnaissance Squadron Photo RF 4C Phantom Exercise Red Flag 1988 02 First Pattern Zweibrucken AFB West Germany Embroidered on twill cut edge 109mm by 72mm four and one quarter inches by two and thirteen sixteenth inches. Originally to be based in France 38 Reconnaissance Squadron Photographic was activated at Furstenfeldbruck Air Base West Germany on 10 July 1952 due to incomplete facilities in France equipped with the RF 80A Shooting Star reconnaissance aircraft and personnel of Alabama Air National Guard ANG 160 TRS which was returning to the US after federalized service to provide reconnaissance cover in Europe for units deployed for the Korean War. The Squadron assigned to 10 Tactical Reconnaissance Group was tasked with daylight tactical reconnaissance in support of North Atlantic Treaty Organisation NATO Cold War operations. Weather conditions in Germany severely restricted the Squadrons training operations with the RF 80A aircraft and the Squadron deployed to Nouasseur Air Base Morocco during the winter where conditions for photo reconnaissance were excellent before relocating to Spangdahlem AB West Germany on 4 May 1953 with the rest of 10 TRW. 32 TRS reequipped with RF 84F Thunderflash reconnaissance aircraft in 1955 as the RF 80 Shooting Stars were classed as not mission capable against the Soviet Mig 15. The Squadron was reassigned direct to 10 Tactical Reconnaissance Wing on 8 December 1957 in line with the removal of the Group layer. The Squadron relocated to Phalsbourg Bourscheid AB France and attached to 66 Tactical Reconnaissance Wing in January 1958 while the runway at Spangdahlem was renovated. 38 TRS was reassigned to the 66 Tactical Reconnaissance Wing in March 1958 which was moving to Loan AB from Sembach AB. 38 TRS reequipped with RF 101C Voodoo reconnaissance aircraft during May 1959 the fastest tactical reconnaissance aircraft ever flown by the USAF. 38 TRS continued reconnaissance duties in support of NATO operations exercises and competitions and relocated to Toul Rosieres AB France on 17 October 1960 and on 1 January 1966 was reassigned to the newly reactivated 26 Tactical Reconnaissance Wing being formed at Toul Rosieres AB. On 7 March 1966 French President Charles de Gaulle announced that France would withdraw from NATOs integrated military structure. The US was informed that it must remove its military forces from France by 1 April 1967. As a result 38 Tactical Reconnaissance Squadron relocated to Ramstein AB West Germany on 1 October 1966 and reequipped with the RF 4C Phantom recon aircraft. The Squadron along with 26 TRW relocated to Zweibrucken Air Base West Germany on 31 January 1973 following USAF and NATO reorganisation and realignment at the end of the Vietnam War. 38 TRS continued reconnaissance duties in support of NATO exercises competitions and operations including deployment to Incirlik AB Turkey in January 1991 undertaking combat photographic recon missions over northern Iraq during Operation Desert Storm February to March 1991. With the end of the Cold War and the phasing out of the RF 4C Phantom 38 TRS was inactivated at Zweibrucken AB on 31 July 1991. 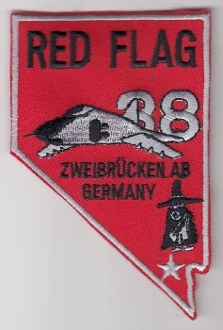 This patch is the first version before the Squadron ordered the version with amendments to the aircraft to make it look more like a Phantom RF 4C and dates from 1988.